Telemark skiing clarifies so many Alpine techniques and quenches advanced skiers’ thirst for challenge. Seeing as how most telemarkers convert from alpine skiing, being on the mountain will not be anything new. Wearing tele boots is more like having mountaineering boots than ski boots on your feet. The hinge at the forefoot takes much of the pressure off the calves and Achilles tendon making walking easier and more comfortable. The gear challenge with telemarking comes from carrying the skis, as they tend to scissor with no breaks to lock them together. Locking your foot into the bindings and attaching the runaway straps takes a different sense of balance than stepping into alpine bindings. The skis tend to want to slide around under you. This is where you discover where your balance truly lies. For many of us, years of being told to lean forward has made us stand on our toes, unfortunately if you do this on tele skis; you will fall on your face. It becomes necessary to take a moment just to stand on your whole foot. Getting on the lift is not much different from alpine skiing, and the lighter weight of the gear is a relief to your knees. Getting off the lift on the other hand brings back memories of the first time you tried to get off a lift. Do you trust yourself to stand up? Commonly first timers wobble and fall; though concentrating on standing-up on your whole foot can save face and rear. Telemarking holds many epiphanies for some alpine skiers. Sliding on telemark skis is much the same as on alpine skis, and in fact, it is easy to make alpine turns. The first realization pertains to balance. Telemarking allows us to feel acutely how each movement affects our balance, revealing when in a turn we lean back or forward. This of course comes in the form of wobbling and sometimes falling. Feeling fear again for the first time in a long time can be exhilarating for many seasoned alpiners. It revives the thrill that drew us to mountain sports that we miss when we become too comfortable with them. As the day progresses, our confidence grows allowing us to again enjoy the intermediate blue groomers we used cruse on alpine boards. Because it takes the legs of Superman to hold a lunge for days, most of us will have to stand up at some point in the turn. Thus the epiphany of patience turns. All the talk from our instructors or friends about rounding out our turns rather than skidding z-shaped turns finally makes sense. Patience in a turn is simply taking time in the fall line, the place that telemarkers get to stand up! Telemark skiing has a reputation for being painful for the legs, and requiring great strength. 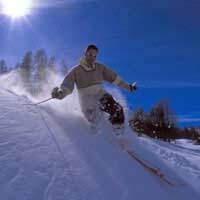 However, like alpine skiing the muscles build up the more days you spend on the mountain. Deep knee-drop tele skiers will feel the burn through their whole thigh, while modern tele’ers might only feel it in their abductors and a little bit in their hams and quads. Either style skier may feel it more in one leg than in the other, as no person is equally strong in both legs. Wobbling and falling are typical when learning any new balance, though in telemarking, falling forward is the new danger. Luckily, knee ligament injuries are less prevalent among telemarkers skiers. The best epiphany of the day is realizing how much easier telemarking is than you thought. It can be a little surprising how quickly you return to steeper runs, especially groomers. And the grace and power you feel can be addicting.